^ 1.0 1.1 Buttler, Tony. British Secret Projects Fighters & Bombers 1935-1950. London: Midland Counties Publications, 2004. ISBN 978-1-857801-79-8. ^ Barnes 1967, p. 371. ^ 3.0 3.1 Flight January 1942 p. 96. ^ Mondey 1994, p. 189. ^ Winchester 2005, p. 48. ^ Winchester 2005, p. 49. ^ "Cofton Hackett production." 互联网档案馆的存檔，存档日期2012-08-23. austinmemories.com. Retrieved: 27 December 2009. ^ Mason 1994, p. 329. ^ Barnes 1967, pp. 377—378. ^ Bowyer 2002, p. 53—54. ^ Bowyer 2002, pp. 142—146. ^ Bowyer 2002, p. 203. ^ Bashow 2005, p. 39. ^ Peden 1979, p. 229. ^ "Short Stirling." Flight, 3 October 1941. Retrieved: 27 December 2009. ^ Mason 1994, pp. 315–316. ^ Interview on DVD "Remember the Stirling." The Stirling Project. Retrieved: 27 December 2009. ^ 18.0 18.1 Gilman and Clive 1978, p. 314. ^ Hall 1998, pp. 18, 23–24. ^ Crawford, Alex. "Stirlings in Egypt." acig.org. Retrieved: 27 December 2009. ^ Trypitis, Yannis. "Stirlings in Egypt." pegelsoft.nl. Retrieved: 27 December 2009. ^ Gomersall 1979, pp. 20–23. ^ Falconer 1995, pp. 187–201. ^ "Stirling." 页面存档备份，存于互联网档案馆 raf.mod.uk. Retrieved: 27 December 2009. Bowyer, Michael J.F.The Stirling Story. Manchester, UK: Crécy Publishing Ltd., 2002. ISBN 0-94755-491-2. "First Details of Great Britain's Biggest Bomber: A Four-engined Type with Fighter Manceuvreability." Flight, 1942. Retrieved: 16 February 2010. Falconer, Jonathan. 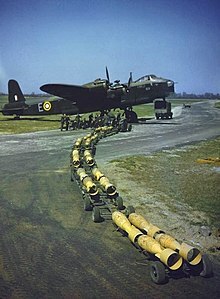 Stirling in Combat. Stroud, Gloucestershire, UK: Sutton Publishing Ltd., 1995. ISBN 0-75094-114-6. Green, William and Gordon Swanborough. "The Ten Long Years of the Short Stirling". Air Enthusiast, Issue 10, July-September 1979. Bromley, Kent UK:Pilot Press, pp. 42–50. Norris, Geoffrey. 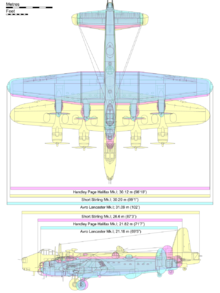 The Short Stirling, Aircraft in Profile Number 142. Windsor, Bershire, UK: Profile Publications Ltd.,1966. No ISBN.